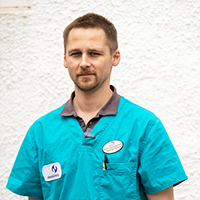 After qualifying from Warsaw University in 2006, Piotr started his veterinary career in mixed practice in Poland. In 2012 he relocated to the UK, where he worked in small animal practices in Hampshire and West Sussex and discovered veterinary dentistry. Over the next 5 years he developed his skills attending courses in the UK and Sweden before joining DentalVets as a full time AVDC resident in May 2017. Outside of work Piotr enjoys a good book, cooking and spending time with his wife, young son and a rescued three-legged Siberian husky. They all like hiking and outdoor activities. Piotr is addicted to blue water sailing.